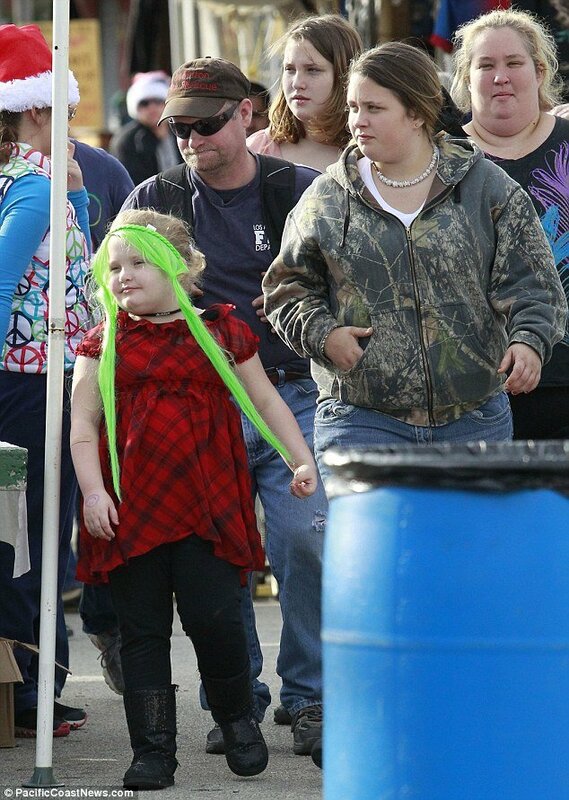 Honey Boo Boo, the 7-year-old beauty queen, whose real name is Alana Thompson, got a head start on Christmas as her family shopped at the Smiley’s Flea Market and Yard Sale in their home town of Macon, Georgia on Saturday. As her family shopped, Honey Boo Boo rode around on her “new” pink and blue training bike that her father and fellow Here Comes Honey Boo Boo star Mike “Sugar Bear” Thompson bought for her. Honey Boo Boo, who is known for her wild costumes as that she wears for her beauty pageants, took an especially festive tone with her outfit, pairing bright green extensions with her red plaid dress over black leggings and sparkly Uggs. Last week, Alana Thompson was named by veteran television journalist Barbara Walters as one of her most fascinating people of the year, a title also shared by U.S. Secretary of State Hillary Rodham Clinton, teen pop sensation One Direction and the scandalous Prince Harry. Proud of their new-found celebrity and fresh of a recent media tour of Los Angeles, construction worker Sugar Bear wore a Los Angeles Fire Department souvenir t-shirt while “Mama June” Shannon strutted her stuff in a black t-shirt with peacock feathers, a zip-up blue hoodie and black sweats. When she wasn’t showing off her new bike, Honey Boo Boo also proudly pushed along her newborn three-thumbed niece, Kaitlyn. The rest of the brood, including Honey Boo Boo’s sisters Anna, Jessica and Lauryn, also tagged along, though whether any of them left with gifts is a mystery as Alana hogged the attention all afternoon. The family famously celebrates the holiday in their neighborhood by hosting a toy drive and a Santa’s workshop at their home. In one episode from the first season of the show, Sugar Bear wore a Father Christmas suit as neighbors came to make their holiday wishes and take photographs. This year, fans can expect the family to have a memorable holiday after the TLC Network, which airs the show in America, ordered a special Christmas episode from its breakout star. During the Christmas special, which airs on February 17, Honey Boo Boo explains why the mother-daughter-duo will be on Santa Claus’ “nice” list this year.